Property Alliance Group’s 29-storey Axis Tower, one of Manchester’s most complex building projects, has reached its highest point. The concrete structure and external envelope is complete, and the recess for the 10-storey media screen has also been created, with installation of the screen nearing completion. An official ceremony held this week saw members of the project team celebrated and thanked as part of the centuries-old builders’ rite. 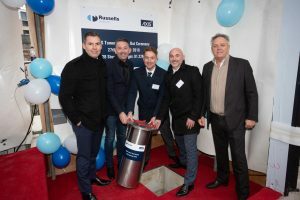 Main contractor Russells Construction hosted the event, with representatives from Alliance and the design team taking part in the ceremony, witnessed by more than 100 sub-contractors and suppliers. A stainless-steel time capsule was buried in a pre-formed opening in the ground floor reception lobby together with items including oil, wine, corn and salt which signify the medieval origins of the ceremony, before the final pour of concrete sealed the opening. John Millward, Russells’ construction director, explained the value of the event. He said: “Reference to ‘Topping Out’ can be found in the history of significant structures such as the Egyptian pyramids and the building of York Minster, and the rite is often recreated with modern construction projects. It’s important to take the opportunity for pause, reflect and thank everyone who has contributed to realising the vision for this landmark new building. Axis Tower stands on a constrained 761 sq metre wedge-shaped footprint on the bank of the Rochdale Canal and requires a temporary platform across the canal to allow access. The concrete structure splays out from the base to ‘clasp’ the upper floors which have larger floorplates than the foundations, in a complex feat of engineering. And a new permanent bridge will be installed over the canal as the final piece of this complex and inspiring build. When complete, Axis Tower will house 170 one- and two-bedroom luxury apartments and two three-bedroom penthouses, all with stunning views over the city and access to a 24-hour concierge service. Sales have already reached 75%, exceeding all expectations. Engineering support was provided by WSP Parsons Brinkerhoff.